Fred shrugged as Cam spoke to him. He appreciated whatnthe colonel had said, even if hevwasnt sure the colonel needed to say it. But still. "Ill see younin the gate room sir. My teams gear is held somewhere different." Basically when they had joined the armourers had never seen a L85. So they had been required to stor their own gear for a while, and it had stuck. So he perled off. Hurley was the first to the beaming room, adjusting his plate carrier straps as he walked through the door. He had been wearing his NWU fatigues since stepping back on base this morning, so the change to combat gear has been quick. Plate carrier, helmet, gloves, and he was good to go. Even though he didn’t get out in the field much, he always keep a fully loaded kit hanging in his locker for situations like this. Over the last couple of years he had found himself letting the straps out more and more, a sign that he needed to double down on his PT in his old age. An airman sat in the corner of the room with a laptop and comms setup. Hurley handed him their target beaming coordinates - the closest Apollo thought it could get them to without hitting the jamming field. “Priority tasking, three-man team to Cartagena, Columbia via Apollo.” The airman brought up the command console and began calibrating the beaming grid. The CWO patted down his gear while he waited, double and triple checking that everything was secured where it should be. The only thing worst than forgetting something was dropping it in the field for the enemy to find. The last things they needed was SGC-issue gear falling into the hands of the enemy or the local police. "Yessir." The young man sent the coordinates and the request directly via a coded transmission. A minute later he received the confirmation as the Australian came in. "Confirmed sir." One floor up wasn't far as the two men swung by the officer's lounge. Ben was half tempted to switch on the TV, as he knew today his beloved Bulldogs were in the preliminary finals. Well yesterday really back home. He checked his watch..."Damn, kick off in one hour and I'll be playing shooting gallery with some mercs and Jaffa. Have a nice day." All that mumbled under his breath as they reached the more secure beaming room. He moved just out of earshot of the Airman, keeping his voice low. "Listen Mr Hurley, I need to ask you this. When we're being shot at madly and there is a lot of screaming and death, can I call you something else." Ben said with his lazy Aussie drawl. He was never too sure with Americans, some were sticklers for the regs, others were not. God even with his own team back in the Stan, his Lance Corp called him Ben in the field. There was one other thing. "Excuse me airman." He reached across to the keyboard of the controller's desk tapping in a few keys. "This is the live feed from the Apollo, we need to pick our entry points now." Of course in a matter of minutes that could change. The last man as usual when Taer walked into the beaming room. Breathing a sigh, he pressed two fingers against the side of his neck to test his rapid pulse and realized he was cutting a bit close. Just a under a minute since he was required to meet the Colonel in under eight minutes. It wasn't too bad. Walking across the room into the secured area, he recognized Ben and saw the other team member. Taer realized they might be able to pull the mission off with just three of them, but he was hoping maybe another one would be joining them. Then again, three men seemed enough. Looking at the Colonel, Taer saluted, "Reporting as ordered, Colonel." Looking at the other team member he didn't know, the captain freely introduced himself, "Captain Amir. Taer, which is my nickname, or Captain would do just fine. Doesn't matter." The Colonel joined him in the beaming room just as the airman in the corner confirmed their beaming request on his console. Michael smiled at MacGregor's request. "Colonel, I've been called a lot of things in my time, almost none appropriate. Warrant or Hurley is fine." It would normally takes weeks, if not months, for a small team like to start working together properly. This was going to be a trial by fire for TF Blackbird. The third member of the team entered the room and introduced himself as Captain Amir, USMC. "Warrant Officer Hurley, US Navy." The three men on the ground would almost double the strength currently represented by SG-9, but it might still not be enough. The CWO had been handed the latest aerial surveillance on his way to the briefing room, which showed an overwhelming hostile force surrounding Colonel Reynolds and his team. "Right, Hurley and Taer it is then. In case either of you get tongue tied at any point in the heat of the battle, I answer to Grizzly more than anything else." Ben doubled checked the map. "We'll insert just outside the wire near the lake, that's about 150 meters. Taer, we need that wire to come down quickly, how good is your underarm? I've done it before quite easily, all you're doing is gently rolling a grenade to stop at the wire...boom! We're in. Hurley and I will take out the corner guard post and that group nearest. 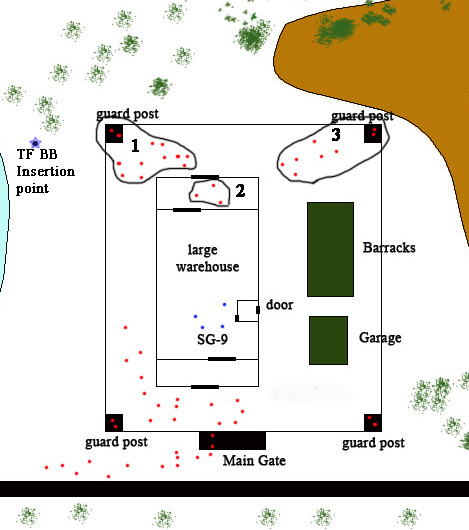 From there we run like hell across the rear section, lob frags into the back door and then take care of the further group near the second top guard post. Hurley, you'll call SG-9 and tell them to leave the building via the side door and bolt north. We'll lead them out into the field to the East. From that point we'll see what our exfill options are." For the entire walk to the Officer's lounge Cate went through everything she had learned about not only herself, but the people who had filled her life and all of those connections that tied back to Mike. There were a lot of them and sifting through what meant something and what was a minor thing wasn't going to be easy for she knew that in the end to bring Mike back to the here and now had to involve those things in his life that no matter how trivial they appeared, were a piece in the puzzle. The TV was still on, she saw the situation in Japan and that raised the hairs on her neck making her want to rush out there and do something. She had to switch off; picking up the remote pressing the red button made that part easy. From there she cast her eyes around the room, it was comfortable, inviting, making it the right atmosphere to make this happen. Until Mike and Coops arrived she chose a slow pacing to fill in the time. The ride down with the elevator was a pure nightmare for Mike, being trapped inside the small confinement of the cart with absolutely no way out. He kept his eyes trained on the door, sweaty palms tightly clutched inside the pockets of his pants and for all his might, trying to remember the breathing technique Annie had taught him as a way to handle this. Long and slow breaths. The feeling of anxiety won’t kill you, it’s just a feeling. Nothing bad will come out a feeling. Yes, it’s scary, but it won’t hurt you. Breath, long breaths in, hold it and count to 3, let it out as you count to 3… and again. As the doors opened, Mike pushed out of the elevator even before they were fully open, only stopping when he reached the concrete wall opposite, bent over with the hands on his thighs and inhaled deeply before straightening up again with his eyes closed. "Easy Mike, easy." How many times had Coops said those words on the battlefield? How many men and women had to be consoled by someone with the red cross on their sleeve when there were no visible signs of wounds? He had lost count, the thing was this reaction from Mike had something to do with memories of his deep past, memories triggered by what? The confinement of the elevator, closed in spaces? That had to be it and there was another piece of the puzzle for someone to work out. Whether or not it was Cate and whatever she could do that the professionals couldn't was to be seen. Still Coops had seen quite a few so called miracles during his time with Stargate Command. If she pulled this off his skeptics meter was going to take quite a dent. Arm around the shoulder Cooper semi guided, pushed Mike towards the lounge. "No it isn't buddy and we'll find the answers one way or another. Come on, I think we're on the last road of your journey back into the world." He stopped at the door. "Cate, how you doing? I guess this is now or never for Mike isn't it?" He asked her, not entirely sure what else to say there and then. The first thing Cate noticed for some reason was the fact that Cooper was wearing sandals, that made her smile bringing back memories of her father and his favorite footwear. She looked at both of them, her arms open wide and welcoming; this with the will of God was going to return Mike to himself and those who loved him. Then she did a double take, looking back at Cooper's feet, yes feet. "Whoa!" She exclaimed softly, realising that was a subject for later as Mike was the focus now. "Mike please, will you sit with me here on the lounge?" She backed up, legs against the soft furniture. To Cooper she left it up to him. "This might take a while Coops, you can go for a walk if you like and I'm sure you'll know about it when we're done." The arm Coops offered helped ground him in the here and now, so after a nod, a quiet “That’s comforting to know,” and another deep breath, Mike accompanied him in to the room where Cate already waited. "No elevators I promise." Typically Cate avoided a direct question and that didn't set well with Cooper. Either she knew what she was doing or she didn't, there could be no half way measures with this. "Listen both of you. I have no idea Cate what you're about to do, but I do know this. If it involves Mike's mind you had better damn well have someone here on hand in case-" He wiped his hand over the bald head. "- well I don't have to spell it out. I'm sure you know what I mean and if its not me, then Anne or one of the other MO's." Mike bowed his head with a sigh. Somehow he’d hoped they would be able to keep this as low key as possible and with no audience. At all. But the thought of having one of the doctors on stand by had crossed his mind too, hadn’t it? While Cate took her place on the couch she sighed deeply. Maybe she was in sync with Mike or maybe it was her instincts; from her point of view there was no way in Hades she was about to allow her mother in her while she did her voodoo magic. Anne is the last person on the planet Cate would allow in the same vicinity for what she knew had to be done for not only from that family connection angle and the trepidation it could cause; the woman as a doctor was far too regimented in her ways and to her as a Doctor was going to see this as nothing more than hocus pocus. Shaking her head wearily the answer came easily, Mike was right. "Coops I love you man but no. I need this to be as undistracting as humanly possible so my mother? No way. You can go fetch Andy if you must but when he arrives here I'll need him to be as inconspicuous as humanly possible. Capisce?" Taking a moment while she could before Cooper's answer came she turned to Mike. "Don't get the wrong idea Mike, we're going to hold hands during this as I need to have as much physical contact with you as I can. At no time are you to release my hands until this is over, I have to stress this." There were other ways as Sunniva had taught her, this though was the most practical for Mike. The blank look on Cooper's face said quite clearly he wasn't overly convinced. Being who he was though allowed him to just go with the flow on this; Mike had made his point as had Cate, so that was it. "Okay I get the point. I'll go chat with Andy and hopefully he remembers who I am; which if he is duty MO today he'll have to sign me in as it is my first day back." He patted the orders from the Air Force Medical Administration board in his back pocket, well folded and pressed by now.